Take on the most human way to engage your clients the industry has to offer by embracing the disruption caused by conversational AI. Make differentiation between competitor dead channels and yours a deciding factor for your clients or customers. They want to talk to your brand the same way they talk to friends. Turn engagement that knows and remembers into power. Give the people what they want, with new accessibility at their fingertips. Support that helps them help themselves to answers. Efficient customer service, fast and effective, is a competitive edge clients need. Satisfy customers in an age of instant gratification. The 24/7 cycle of news, content, and hours of operation isn't going away. Make what's impossible for people, possible with bots. Without engaging touchpoints, there can be no targeted lead generation or awareness building. Add conversational AI to the mix. With today's expectations, clients might not be as surprised as they would have been last year. Go above and beyond with the latest. There is no one size fits all. Voice, tone, content, and context are all part of the journey our engineering team can help you through. You hear it, loud and clear: chat and conversational AI is taking over. Chatbots are now poised to disrupt several markets, including customer by service, sales, marketing, technical support, and so on. Gartner predicts in one of its reports that by 2020, 30% of web interactions would be voice-first or "screenless." Chatbots are expected to have a deep impact on how customer service and sales are being conducted. The consumer shift towards messaging platforms, and the new functionality those platforms are offering, can present extraordinary opportunities for business. Chatbots are an essential component in pursuing these. And we can implement. Our team understands how to offer automated services and unified experience to your customers across the "omnichannel." Today, they won't be surprised to be interacting with your brand, using both text and voice capabilities—Alexa, Google Assistant, Facebook Messenger, Slack, or Skype. Tomorrow, they'll expect it. Use AI for your Bots to perform intelligent activities and converse in human way and understand language using NLP and NLU technologies. This alongside Machine Learning to learn and predict can achieve great results. When it comes to bots, it’s importance to recognize users intent with minimal user input and that’s where our team excel in building great UI / UX experience for your end-clients, and with them solely in mind from A-to-Z. 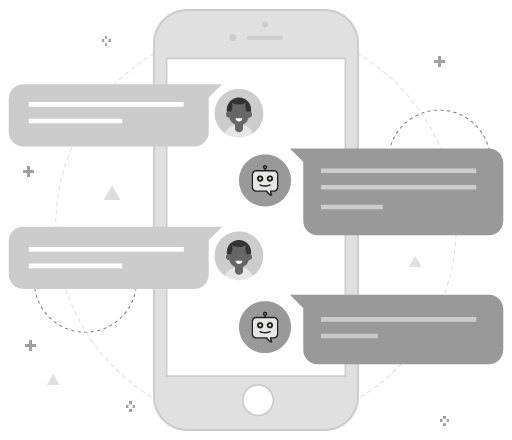 We leverage bot frameworks like Amazon Lex, Microsoft Bot Builder, Dialogflow, Rasa to provide both chat and voice based bots for immersive engagement. We believe in embracing disruption and have a history of doing it with some of the biggest names in Open Source. With our agency affiliates as partners and clients, we act as their global implementation partner to deliver and support successful digital transformations. Conversational interfaces, Big Data, and IoT are new frontiers for many of our agency affiliates, which is why we're committed to helping you navigate by example, so you can lead your clients with confidence. We realized that today the landscape is mature enough to begin adopting some of these technologies, and provide our customers new ways to interact with their end-customers. One of our Engineering Managers thought of building a bot for eCommerce, to change the shopping experience for both businesses and consumers. This is how he did it. Learn more. Don't be afraid of change. Embrace it.